Lauren and Courtney are having trouble sharing, so they divide their room in half and split their toys-Lauren takes the brushes and Courtney takes the paints; Lauren takes the stools and Courtney takes the table-all so they won't have to share! But the sisters soon realize that it isn't fun to play alone. 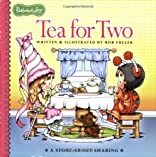 Come share a cup of tea with two sisters as they learn that in order "to live life to the fullest, share every last drop of it with your friends!"